The beauteous red-head Emma Stone just won Best Actress at the Venice Film Festival! This is big win for Emma, and really turns the Best Actress Oscar Race upside down. I thought it was going to be a slam-dunk for the unawarded genius of Viola Davis in “Fences” repeating her Tony triumph, but holt on! 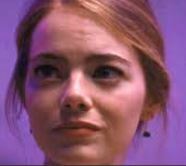 It may not be that easy with Emma Stone, radiant, young, and a past nominee, too,for a film that won Best Picture , “Birdman” is now in a very strong position. Much stronger than I thought she’d be this early on. Viola’s reps may have to think about her going Supporting for “Fences.” And she’d surely win in that category. Sasha Stone has it all and all the other winners at http://www.awardsdaily.com of the Venice Film Fest. This is bad news for Viola. “Fences” is opening later this year, outside of the Festival circuits. And Sasha believes that a film has to open right around NOW, in order to build Oscar consensus. As “Spotlight” did last year. Playing TIFF. And now we have “La La Land” being everyone’s new favorite movie and the new front-runner. I’m seeing it next week and I’ll let you know what I think of it then, for sure. But this is bad news for Viola, who I think is on her was to another Emmy for “Getting Away with Murder” her TV show. I really did enjoy Emma’s performance in Woody Allen’s “Irrational Man” two years ago. And felt that “Cafe Society” was really written for her, not the tough-er cookie Kristen Stewart, who seemed overall uncomfortable in that sweeter-than-sweet ingenue role. whereas Emma would’ve been just right. I hope this is not going to go down this way, but Denzel (who’s currently finishing the editing of “Fences” ) better hurry up. He’s on everyone’s mind with “The Magnificent Seven” opening in Toronto. Yes, he stars in that, too. I saw Viola onstage in “Fences” and she and Denzel BOTH won Tonys for their portrayal of an African-American couple in the ’50, who are finally able to buy their own house. And they were both beyond brilliant. But Emma Stone…she could win for “La La Land” if the older Academy doesn’t feel comfortable with what seems a younger/skewing movie. Anne Thompson said this on her podcast this week. But historically, the SWARM(Straight White Old Rich Men) who have always dominated the Oscar voting have ALWAYS gone for the cute, young girl of the moment. Which right now is Emma Stone. Sasha thinks that “La La Land” is going to win Best Picture. She saw it at Telluride, so she should know.